Top » Catalog » Game Specific Products » Sega Star Trek Bookmark Us! Star Trek Strategic Operations Simulator began manufacturing in 1982 by Sega - a licensed property based upon the TV Series by the same name. 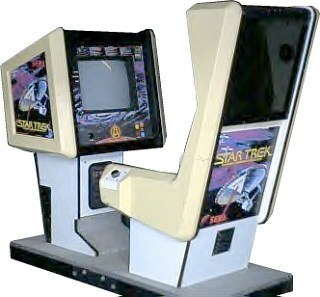 This Arcade machine features a Spinner control instead of a joystick - which rotates the USS Enterprise around a point. Impulse, Phaser, Torpedo, and warp button round out the controls. The Game sports Vector graphics; which while simple, was higher resolution than other games of the time. It came in a standard Upright cabinets and an Environmental Cockpit affectionately known as the "Captain's Chair". Digitized voices of Scotty and Mr Spock are present at the beginning of each game.